That every child and young person has the possibility to hear, respond and personally experience and grow in the Gospel. 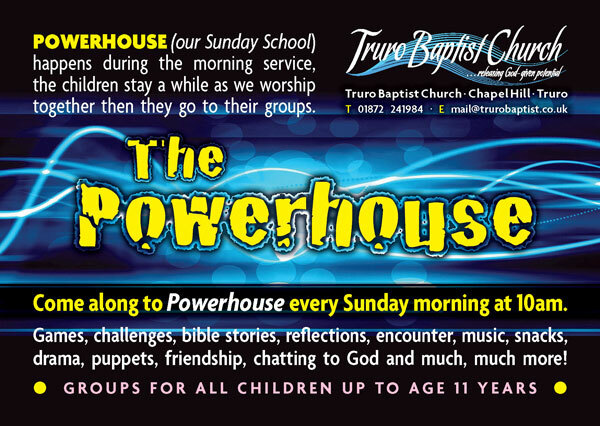 It is our desire that Truro Baptist Church provides an environment for children and young people to be nurtured in their spirituality, to grow through personal faith and be released into their God given potential. All those involved in this ministry are DBS checked and work within the guidelines of our Safeguarding policy. Children and Young people are a diverse, vibrant, valued and welcomed part of our church family. They regularly participate in leading different aspects of the life of the church. Everything we do is based on biblical principles, with an age relevant and child focused approach. Powerhouse is the name we give our children’s work. CLICK HERE to see more of what goes on in Powerhouse! We have an active youth group! CLICK HERE to see more of what they get up to.